Welcome to another edition of Fly On The Wall group blog postings, hosted by Karen of Baking In A Tornado. Today, eight bloggers are inviting you into their homes for a glimpse into their private lives. Before I get into the humor part of my FOTW post, I'd like to share an important message with you. This week I am honored to have a special article featured on The Mighty, and I'm hoping everyone will take the time to read it. This was a difficult story to share but one that needed to be told in order to help others suffering from Binge Eating and Body Dysmorphic disorders. A help line number is included at the end of the article. You can read the post here: https://themighty.com/2017/04/being-eating-disorder-body-dysmorphic-disorder-in-children-recovery/ Please help me spread awareness of these forms of mental illness that have robbed so many women and men of living normal, healthy lives. Anyone up for a game of Jumanji? Either I had one too many mugs of beer or I'm seeing a real life "Ram-Man"
Not sure what tribe she is representing but I'm digging this outfit. I've always said that I have the appetite of a Viking, so I think I just found my spirit people. Two lovely ladies out for a stroll....but they're probably smuggling flasks of rum under those skirts. Hubs has been out in the sun too long. This is his war cry for, "GET ME OUTTA THIS PLACE!!" Looks like lots of fun. I think I'll take a buzz around those other blog sites. That looks like an amazing festival! Love all the costumes. Love your look, too Marcia. p.s. loved your piece at The Mighty. Shared. Thank you for sharing the article, Lisa. Yes, the festival is so much fun! 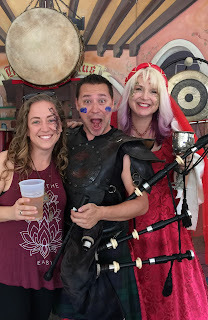 It's been ages since I went to a Renaissance Fair. I need to fix that. When you get to heaven, I bet it looks like the Renaissance Festival! I love your family and your renaissance days. I love the pictures!The Ram-Man is different! I love The Mighty. They've had some amazing resources that have helped me greatly over the past 12 months. Well done for getting featured there. And I love your ren fair photos, we don't have anything nearly as elaborate at the ones down here. I love to see people really getting into the spirit of it. The Steampunk guy at the top is cool. It's always fun to dress up and have fun. Woohoo! That looks fun! Thanks for sharing this with us. The festival looks so much fun, you really spent an incredible time!